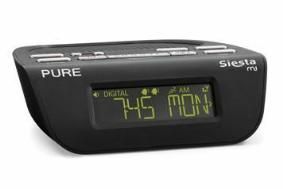 Pure releases Siesta Mi bedside DAB radio for £39.99 | What Hi-Fi? It's Pure's most affordable bedside DAB radio to date, selling for £39.99. Two separate alarms can wake you to DAB or FM stations, or a tone, and the large display automatically adjusts to suit the light levels of the room. Sleep and snooze functions are included, and the Siesta Mi is part of the company's EcoPlus range, meaning it's designed to minimise its impact on the enviroment. "At such a great value price, why would anyone consider buying an analogue radio which would be virtually obsolete within a few years," says Colin Crawford, Pure's marketing director.